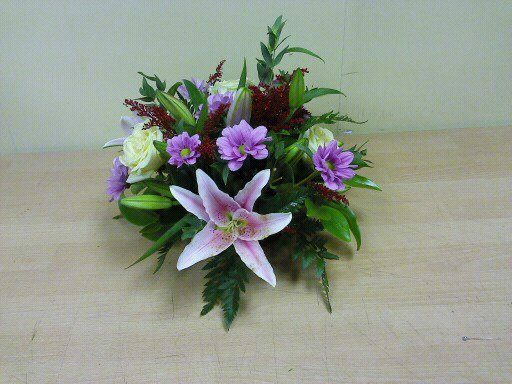 Posy Dish of fresh flowers including Lillies, Chrysants, Roses and foliage. Nice size for a counter top or table. Seasonal posy dish of cut flowers arranged in oasis and in a dish. Ideal gift for someone if they do not have alot of space. This is suitable as a birthday or get well gift or simply to say thank you to someone. This can be made in different sizes and colours.